A retail and wholesale indigenous plant nursery, Goldfields Revegetation has a strong commitment to environmental awareness and education. The nursery has also won an award for the operations principles of Best Practice Environment Management. Catering to a demand for indigenous plants in Central and Northern Victoria as well as Metropolitan Melbourne, proprietor Ashley Elliott is passionate about the local flora and its ability to survive and indeed thrive under pretty harsh conditions. "The plants that will grow well have evolved here over thousands of years." "They have adapted to the amount of rainfall (500 millimetres), adapted to the frost and adapted to the soils, therefore you don't have to change anything, you don't need watering systems." The nine-hectare nursery site, which was designed by consultants Greg Burgess and Taylor and Cullity, has provision for car parking with adjacent display beds of indigenous plants for specific regions. There is an environmental shop with displays of nesting boxes, weed identification posters and bird feeders next to the retail area, with most stock available in tubes and/or 150mm pots. There is also some advanced stock. Propagation and growing-on areas are well separated from retail operations by large areas of wildflowers grown for the cut-flower industry. These plants are set out on contoured ridges covered in weed mat and mulch and watered by sub-surface Israeli dripper tube. 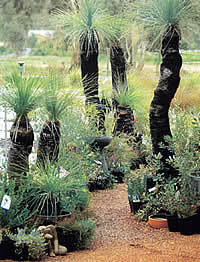 The nursery initially grew indigenous and other Australian wildflowers and this is still a major part of the business. Another aspect Goldfields Revegetation is keen to encourage is the use of indigenous trees for farm-forestry projects and the nursery has an extensive display of different local timbers in the environmental shop. During summer the water supply for the nursery comes from the pipeline that carries water from Lake Eppalock north to farmers who irrigate. However, this can be cut off at short notice; so two large dams on the property provide for irrigation needs at all other times. "We had to think quite cleverly about how we manage this system," "We have to recycle water because it's just such a valuable resource." Water overflows from one dam down a waterfall, alongside a path, underneath the environmental shop and then through a wetland/biological filter of indigenous water plants to end up in a small pond and is returned to the main dam via a submersible pump. All run-off from the nursery ends up either in the dam or the pond - nothing is wasted. Salt and nutrient levels in the water are regularly monitored. Goldfields Revegetation also offers site inspections, environmental management plans, direct seeding, contract growing and planting and revegetation proposals for environmental effect statements. Current revegetation projects are for Bendigo Mining and the nursery has also supplied catchment management authorities, Landcare groups, local councils and large corporations such as Telstra and VicRoads. Summer months are spent collecting seed with licensed collectors and advising clients what to plant. " In summer we help people plan what they are going to do." "We would prefer people to come back later on so we plan with them what they are going to get and quite often we take their order and then after we've got sub-soil moisture which is June/July we plant." "The plants have hardened off and frost is not an issue; into the ground they go and they take off in spring." 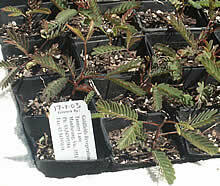 The provenance of the plants that they sell is crucial to Goldfields Revegetation. "The provenance of everything is really important." "The genetic resources of particular plant populations - I think it is so important to keep them. I mean we are left with only 15% of the box/iron bark forests - that's it! And it's a unique forest - no where else in Australia have you got it!" Nursery staff are keen to pass on the environmental lessons they've learnt to the next generation and regularly conducts tours. 'We have Landcare groups, school groups and university students studying environmental science visit the nursery and then we go on site visits locally and look at revegetation." "it varies with what they want to look at because we're involved in so many things." The management of the nursery has resulted in Goldfields Revegetation winning a Victorian Tidy Towns Commercial/Industrial Site Award in the Keep Australia Beautiful Rural Pride Awards. The nursery won the award 'for being an operation that demonstrates the principles of Best Practice to the Environment Management'. "Our commitment to environmental awareness and education, our ability to embrace strategies to reduce waste, conserve energy, encourage recycling, and avoid air and water emissions as well as maintain a pleasant working environment has been recognised by this award."